Water Holes, Lower Antelope, Upper Antelope. Are these the names of hiking trails? No, they’re Arizona slot canyons located on the Navajo Reservation near Page, Arizona. Alan and I discovered the photogenic gems while on a photo workshop. But you don’t have to be a boomer photographer to enjoy exploring canyons carved by nature’s power. Walking through the twists and turns of Arizona’s slot canyons will spark the imagination of any active travel enthusiast. Upper Antelope Canyon: an easy-to-explore Arizona slot canyon. Upper Antelope Canyon is the easiest Arizona slot canyon to maneuver. After paying a hiking and permit fee (around $21 on our last visit), a truck takes visitors from the starting point off Highway 89 near Page, Arizona, to the canyon’s opening. Access is via a level, sandy path—no stairs or climbing involved. A Navajo guide accompanies travelers through the canyon on a one-hour trip where a combination of water and sand has etched the walls into a wonderland of texture and curves. Beams of sunlight shine down from the cracks in the canyon overhead. When the wind blows, dust drifts in swirling through the light in a ghostly dance. 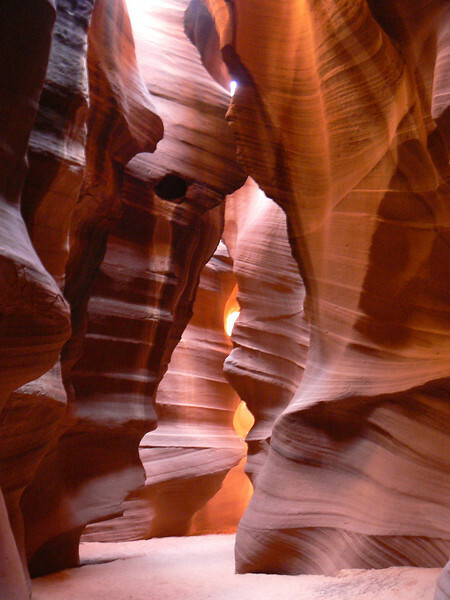 Adventure seekers will prefer Lower Antelope Canyon. Located on Copper Mine Rd. off Highway 89, entrance requires a permit and hiking fee (around $21 at the time of my visit). To reach the slot canyon, visitors follow the guide along a crack in the earth’s stony surface until it widens, leading to stairs that descend into the canyon. Warning! This is not an adventure for claustrophobics. They way is narrow but oh so worth it. Alan and I spent almost three hours exploring this photogenic fun house, slipping through narrow passageways, maneuvering several short drops via stairs, craning our necks for the view above us. When the light peeps in through overhead cracks, the textured walls turn into purple, yellow and orange curtains of rippling stone. The textured walls of Lower Antelope Canyon in Page, Arizona. Water Holes Canyon involves a bit of orienteering. A permit and hiking fee is required to access this Arizona slot canyon located south of Page on Highway 89. There’s no signage on the highway to direct you so it’s best to go with someone who’s familiar with the area. After a short hike, the canyon is accessed by walking down its sloping walls. The portion of Water Holes that we visited is not as dramatic as Lower or Upper Antelope and has a more rugged feel to it. Need a place to stay? Start your research for hotels in Page with us. 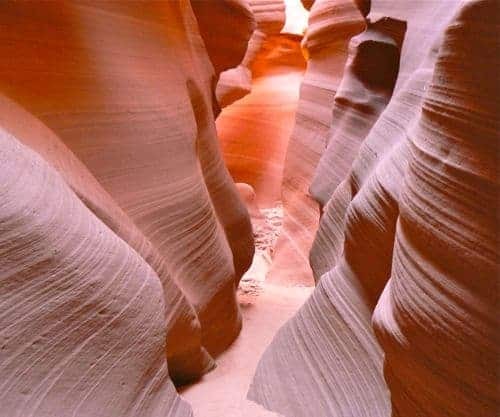 Exploring Arizona’s slot canyons is one of our favorite adventures in the American Southwest and a boomer travel experience that Alan and I will be repeating. But, we won’t be going during monsoon season when flash floods make hiking in the canyons a dangerous endeavor. Are you a slot canyon enthusiast? Join the conversation at the My Itchy Travel Feet page on Facebook or send us an email to ask a question or share your experience.